Rhaine, I want to document all you milestones like what I did to your ate, yung unang pagdapa mo last Christmas Day, yung unang pag gapang mo, yung unang pagkain mo ng solids and so on and so forth. 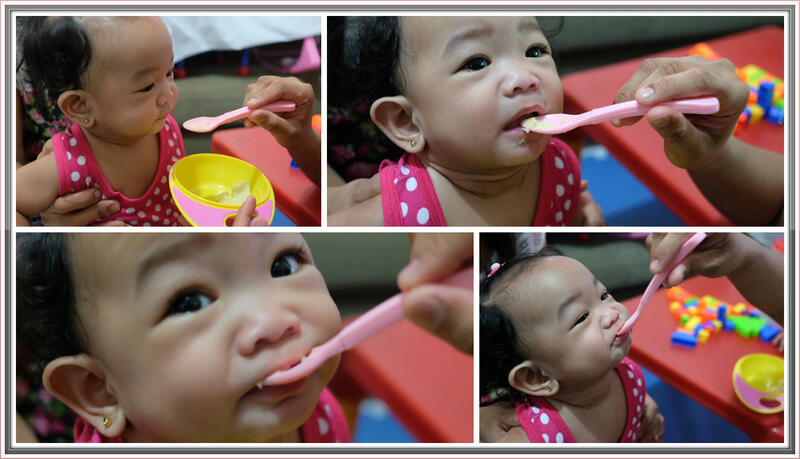 But for now I want to share your first solid food experience that was happened on the day of your 7th month. Like what I told you on my previous letter, I decided to delay your solid food intake kasi nga nagkasakit ka on your 6th month and to be safe I need to wait until you’re totally fine. Unlike your Ate, you don’t drink milk too much, halos enough na ang 6oz sayo kaya siguro mas payat ka compare to your sister but don’t worry anak, pag malaki laki ka na babawi tayo sa pagkain ng solids ha. I decided to give you organic mashed potato for your first solid food, You are so excited when you saw your feeding plate, actually you immediately grab it and taste it. Ikaw talaga anak, you’re so macutelit. Your former yaya was holding you while I am the one who feed you, Ate Ching Ching is you number 1 fan and your dad was taking the photos. O db join force kami lahat. Anyway, here are some of the priceless photos for you to remember when you grow up. And as of today, you already tasted mashed potato and mashed squash. I’m still thinking of giving you naman some healthy fruits like banana and apple. Let’s target the 10 kilos on your 1st birthday ha, kaya dapat lakasan mo pa ang pagkain mo ha.